There is something about cheese on chicken that gets me every time! I love it. Please check out Matt and Aubry Laidlaw to see some other really good recipes and give them some traffic since they are fairly new. Us bloggers need to support each other! Thanks so much. This looks like a really easy recipe to make. I can just imagine how good the flavors are together. I will let you know because it is on my list for meals this week. Just wanted to share this with you since it looks so good! 1. Preheat a grill pan over medium heat on the stove top. Spray with cooking spray. Combine balsamic and olive oil in a bowl. Season both sides of chicken with pinches of salt and place on grill. Brush top sides of chicken with balsamic mixture. Cook for 4-5 minutes and flip chicken. Brush with additional balsamic and cook for an additional 4-5 minutes or until cooked through. During the last 2 minutes of grilling place 2 slices of cheese over top each chicken to melt. 2. In a large bowl combine the tomatoes, basil garlic, salt and balsamic. Toss gently to combine. 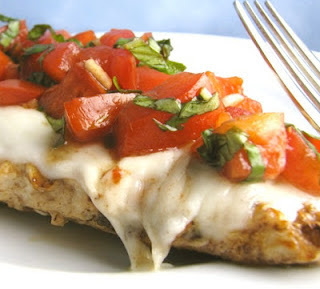 Place chicken breasts on a serving plate and top with tomato mixture. Serve warm. Mmm.. I tried it. Delicious!!! Can you bake this instead of using the stovetop?? I made thist the other night and it was absolutely delish!